Whilst working at Tribal Worldwide I was asked to carry out a review of the Fitness First website as it was at the time and make a full audit of the content found on four of eleven international versions of the site. After creating a sitemap of the UK website I then used this model to create maps of the other three country websites and mark out pages that were unique to each one. After this I worked with the analytics team at Tribal to access Google Analytics data to understand which pages were getting the most traffic. 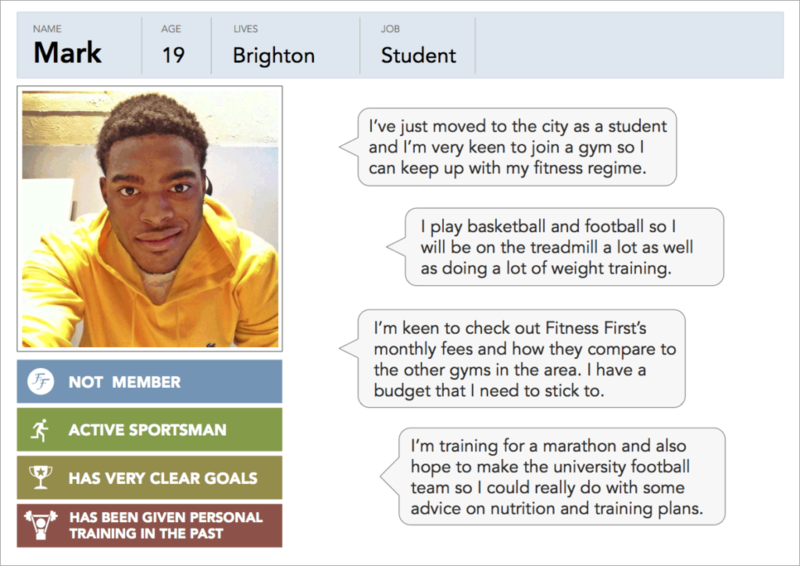 I used a set of simple personas to flesh out scenarios for visitors to the Fitness First site, for example someone wanting to check out the fees for joining a gym, or to understand the classes on offer. I reviewed the way the current site responded to the needs detailed in the scenarios as well as comparing it with competitor offerings. Finally, I suggested some UX changes that could be made to improve the current site and better meet the needs of visitors. 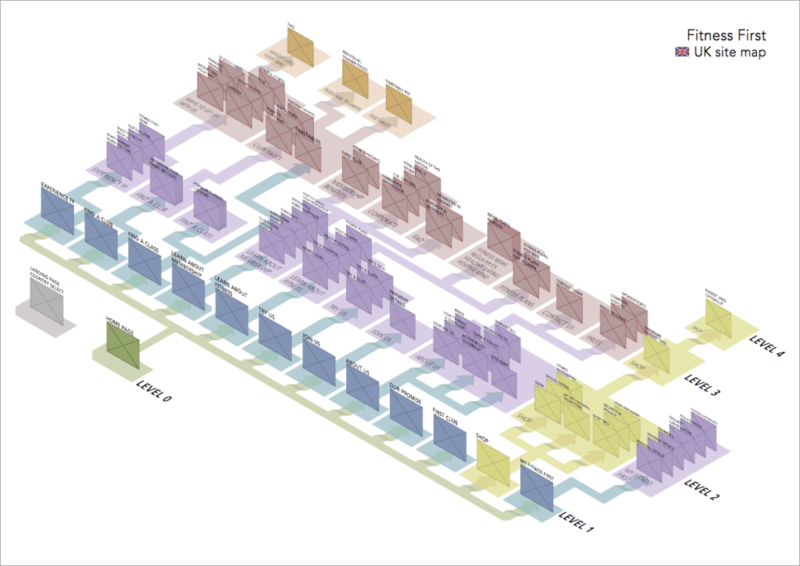 This is an example of a sitemap that I created to show how the pages of the UK Fitness First website (as of March 2013) are organised. 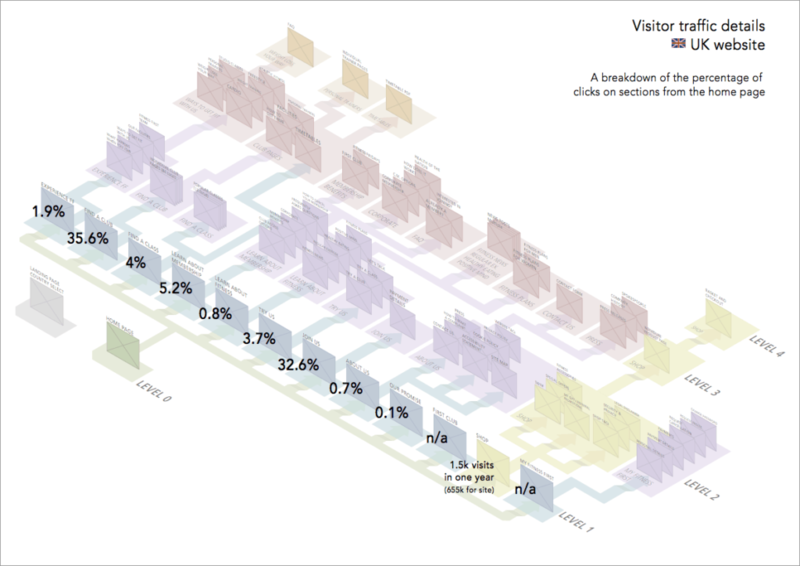 The sitemaps were then overlaid with Google Analytics data to show how the traffic breaks down across the site and detail which pages were most popular, as well as search terms associated with the way people accessed the site. 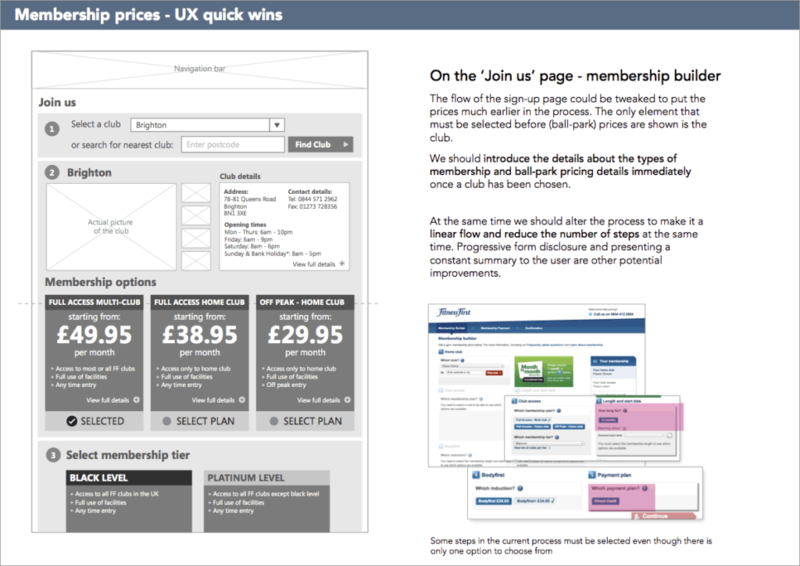 An example of a persona that aided in the creation of user scenarios that helped to interrogate how well the site is serving its visitors. 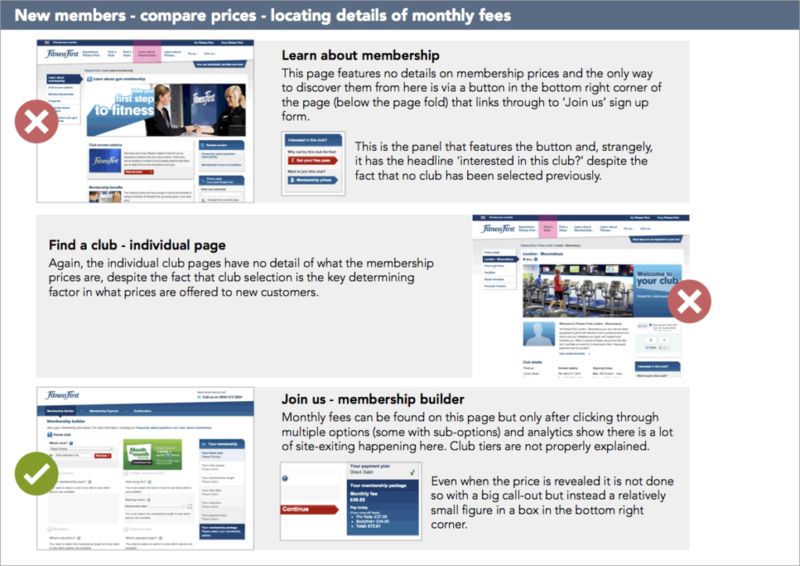 This is an example of a page from my review of the existing site that was intended to detail how well it meets the needs of user scenarios, including checking the cost of joining and seeing what classes are available. This is one of several UX ‘quick wins’ that I created once the review was complete and I understood why the site wasn’t meeting the needs of users (at that time). 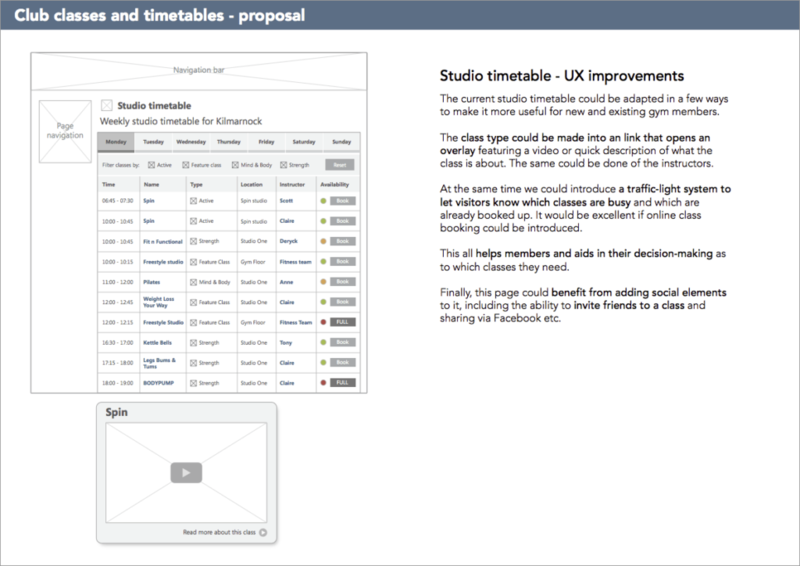 Another example of some suggestions for UX improvements to the site, this time for the timetable pages. 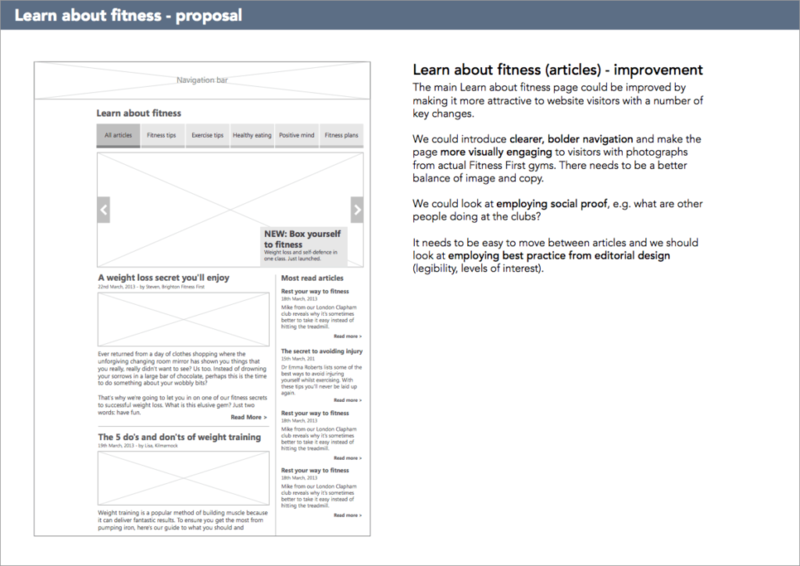 Further suggested improvements that could be made to the site, this time to the articles section.